Important news, events and information from the video surveillance industry. 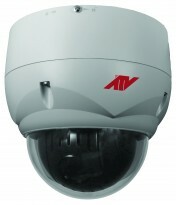 Coppell, TX – September 09, 2015 – Advanced Technology Video (ATV) a leading provider of innovative video surveillance solutions, announces the release of its new vandal resistant 12x PTZ network security camera to the ATV IP Series product line. ATV’s new 2 Mega-Pixel IPSDV12XW PTZ is equipped with a 1/2.8” Sony Exmor CMOS image sensor and 12x, 4.8-57.6mm lens, Auto-Focus, and Optical Zoom Lens with 16x Digital Zoom function. The camera features TRUE Day/Night and WDR functionality for all lighting conditions, triple streaming, H.264 and MJPEG compression, up to 60-ips @1080p, Digital Noise Reduction and Digital Image Stabilization along with Video Content Analysis (Video Analytics) features such as Line and Field Detector. In addition, the IPSDV12XW supports a Micro-SD card slot for event and continuous recording, is IP66 rated with a built-in heater and offers 12VDC/24VAC /PoE power source options. “ATV continues to add to our IP product line. The new PTZ is a popular solution for those looking for quality images from multiple angles”, says Keith Shaver, ATV’s VP of Sales and Marketing. The new high speed PTZ camera along with the included VMS has the capacity to record and manage up to 64 Cameras and view up to 16 NVR’s with the professional license-free remote management software, ATVision IP. About Advanced Technology Video: Advanced Technology Video has been a force in the security business since 1983. Since then, we’ve delivered products with unmatched reliability and value to the security industry. Today we’re stronger than ever, with a complete lineup of CCTV products that set industry standards for dependability and support. Our full line of cameras, recorders and other devices are loaded with features you won’t find anywhere else at the same price. And we back those products with the best customer service and technical support available anywhere. So take a good look at all we have to offer. It’s clear that whatever the needs or the application, ATV offers just what you demand. For more information on innovative ATV products please contact us at 888-288-7644 or visit our new website at www.atvideo.com for the latest products, literature, training and industry news, or visit us on Facebook, Twitter, LinkedIn, Google+, or Pinterest.